This story is twofold. In 1859, a prospector named Asa shows up on the Fraser family farm in Nova Scotia. He entices Mr. Fraser with gold, and wins the daughter, Josey’s, heart. In present day, the Fraser descendants still lived in the same home on the same land until their house burned down a couple months back. Tara Fraser is struggling to deal with that and starting school after two years of being home-schooled by her mom. The two stories collide, one ending in tragedy, and one in hope. 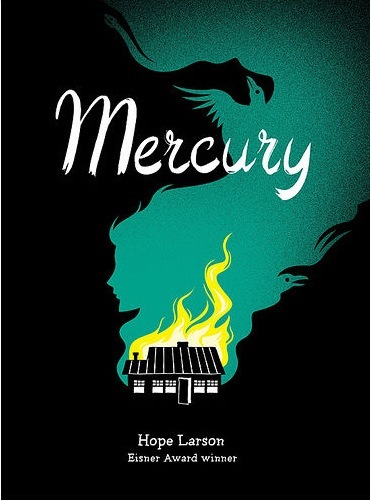 I really liked Gray Horses when I read that for Readathon last year, but I think I liked Mercury even more. The story wasn’t quite as surreal (though it did have a few of those moments), and I liked seeing how the two stories unfolded and tied together. Unlike with most twofold stories like this, I didn’t favor one story over another. Both equally interested me and I was equally invested in them. I also adored the artwork. This made a very good Readathon book and I was very happy I made the last-minute decision to grab it from my library the day before the event! This entry was posted in 2010, Visual, Young Adult and tagged historical, readathon, speculative. Bookmark the permalink.